Does Ginkgo Biloba Improve Concentration? I’m really of the anti-supplement mindset. I’ve used them in the past especially when doing triathlons and bicycle racing but for the last 12 years, I’ve stayed away from any kind of supplements. I guess I think I’m always eating enough variety and it’d be a waste of time to take more of what I already have plenty of. I lucked into a good health stream here in Thailand and I’ve not been sick at all in more than five years. Most supplements are unnecessary. That’s my thinking anyway (Vern-logic). During graduate school in 1995 I was having trouble holding it together to study. I’ve mentioned that I have ADD (Attention Deficit Disorder), and especially during grad school when I had classes, practicum, big brother volunteering, work, exercise and a girlfriend, it was too much. I had a heck of a time studying when I needed to. My mind was going every-which-way. I’ve never taken Ritalin or anything to treat ADD, though at times in the past I’ve considered it. My brother has taken it and said his creativity just dies when he’s on it – so that was the deciding factor for me. Better to live with monkey-mind than lose my creativity. Bulk Gingko biloba leaves from Japan. I’d read about Ginkgo biloba in a couple of magazines I subscribed to. These appeared to be minimally biased articles (nothing is unbiased!) about the benefits of it. In addition to helping Alzheimer’s patients with memory deficits, other benefits were mentioned like concentration increasing in intensity and duration. I found more articles by researching health journals in the university library and it seemed like pretty safe, natural stuff with some side effects including possible increased risk of bleeding, gastrointestinal discomfort, nausea, vomiting, diarrhea, headaches, dizziness, heart palpitations, and restlessness. I noticed death was absent as a side-effect, and the rest I could live with once. I decided to try it on a trial basis and see if it helped me concentrate while studying. I started taking the minimum recommended dosage (60mg) 150 minutes before I was to study. That was when it was at its peak in the bloodstream. While I didn’t have any side effects at all I didn’t notice any real improved concentration effects at first either. Over one week I ramped up to the maximum suggested dosage of 200mg. At this dosage, I noticed a real difference immediately. I was studying – reading a book and highlighting important bits when I realized – I’ve paid absolute attention to what I was doing for the past 90 minutes! I was in the flow – while studying! That had never happened to me before in my life. I wasn’t even necessarily very interested in the material, I think it was something about biochemical aspects of disability – and yet I was sitting there in complete attention to the process of studying. That was an amazing moment in my life. I was floored. I attributed it to the Ginkgo, as that was the only thing I’d changed recently. Over the next few weeks, it got even better. If I wanted to study or think about something – I was able to with little problem. My mind wasn’t jumping around to analyze extraneous sounds, sites or thoughts. I was able to focus on just what I wanted to focus on. I remember thinking what a powerful feeling it was. I remember asking myself over and over – is this what normal people feel their entire lives? No wonder people can pull it together and write a book or graduate top of their class at Yale. If you can concentrate you can do anything requiring extended bouts of sustained, focused thought. I continued to use Ginkgo on and off during graduate school usually at the end of a term when I really needed the level of focused mind it seemed to give me. I was wary of using it all the time because I’m concerned about taking any kind of supplements over the long-term. I did use it often though. I noticed no change in the level of creativity while taking Ginkgo and I haven’t heard about others experiencing such side effects. After grad school, I stopped taking it. The level of stress in my life decreased substantially and it was right about this time that I found meditation. Meditation has since taken the place of Ginkgo. It gives me a peace of mind, a balance, and equanimity that is available anytime without supplements. 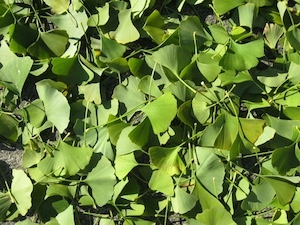 The price for good Ginkgo here in Thailand is around $100 USD for a two month supply. Twelve years ago in the USA, it was around $30. I hope the price hasn’t risen over the years. Isn’t it supposed to decrease? That’s my private logic anyway. Anyone else using Ginkgo and want to relate your experience? Please leave a comment! Though the original product I used was years ago, this looks like the one – it was mixed with Ginseng like this. You’ll need a few bottles because it has to build up a level in your system before you notice the effects. DO write me and let me know how it changed your ability to concentrate – I love hearing the stories. I encourage you to read more about Ginkgo Biloba before trying it for yourself. The effects that are claimed by companies manufacturing Ginkgo biloba are not wholly supported by research. The success I seem to have had could be the result of the ‘placebo effect’ I guess. But I had been at that time, diagnosed with profound ADD – ADHD. Elsabagh S, Hartley DE, Ali O, Williamson EM, File Se (2005 May). “Differential cognitive effects of Ginkgo biloba after acute and chronic treatment in healthy young volunteers”. Psychopharmacology (Berl) 179 (2): 437–446. PMID 15739076. BBC News: Herbal remedies “boost brain power”. Dose-dependent cognitive effects of acute administration of Ginkgo biloba to healthy young volunteers. None of what I’ve written should be taken as medical advice or persuasion. I am simply relating the first-person account of my experience with Gingko Biloba. Your experience may differ. Please research fully before embarking on your own experiment! If you haven’t yet, please read this disclaimer.